Dogs are less likely to use deadly force appropriately than responsible people. Depending on their training, they may hurt a person who shouldn’t be bitten or fail to go after a genuine intruder. 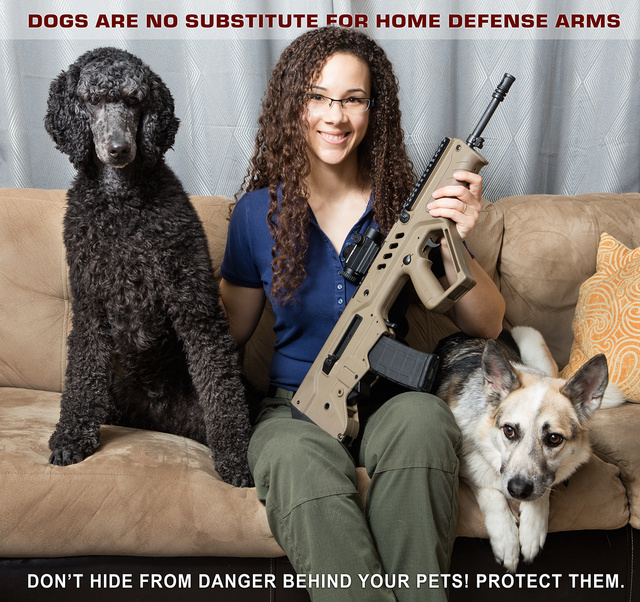 Dogs are more likely to get hurt by intruders than are residents using firearms for self-defense. Dogs just aren’t as well armed as humans and have to get close to fight. The dog shown above are working breeds. Most companion dogs are ornamental and at even more disadvantage before intruders. A fight between a 180lb criminal with weapon, and a 30lb or smaller animal doesn’t favor the dog. Dogs do excel at providing early warning to their owners. Next time somebody says: “You don’t need a gun for home defense. Just get a dog.”, ask them why they insist on sending their pets into harm’s way instead of being the responsible adult in the relationship and taking care of problems with appropriate tools in hand. This entry was posted in pet, rifle, rkba, self-defense, weapon and tagged 223, bullpup, dog, Tavor, Vortex. Bookmark the permalink. My dogs are family, and the only thing I ask is they bark if someone is breaking in. We’ll do our best to handle the rest. They excel at two things; early warning and distraction. > They excel at two things; early warning and distraction. And pooping. Don’t forget the pooping. The agreement is cat alerts me to problem and I solve problem. I have always seen my dogs as an alarm system that gives kisses. I specifically do NOT want them engaging, because I don’t want them to get hurt (and they might spoil my aim). I greatly prefer they hide behind my skirts whilst I ventilate intruders.